With an impressive growth record in this industry, we are providing a wide array of Mother Of Pearl Tile. 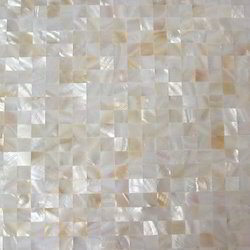 With rich industry experience and knowledge, we are providing an excellent quality range of Mother Of Pearl Tile. 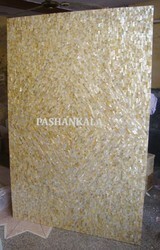 We manufacture a lot of furniture items of Black Mother Pearl. Black MOP has a nice black-silver effect. Beautiful MOP work piece with flower design. Among our wide range of products, we are offering a premium quality assortment of MOP Square Tile. Tile size : 30 cm x 30 cm , also available in customise size. Usage : Golden Mop flooring tile, Golden Mop wall tiles , Golden Mop table top , Golden Mop vanity top, Golden Mop slabs, Golden Mop coffee table, Golden Mop decorative wall panel, Golden Mop soild tiles, Golden Mop bar counter.